Home Stats Is SMS Missing From Your Mobile Strategy? [Infographic] Is SMS Missing From Your Mobile Strategy? 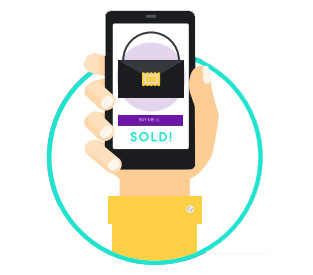 Product Manager Alec Berry, takes a look back at the webinar that he presented “Is SMS Missing from Your Mobile Strategy?” He also showcases an infographic that highlights the key growth trends and stats in M-Commerce. Recently, I presented a webinar on the state of M-Commerce and I wanted to take this opportunity to share some of the key takeaways from it. Alongside this, I also wanted to unveil a complementary infographic put together by our amazing Marketing team! I found this subject extremely interesting when compiling the content for the webinar and soon realised that it’s easy to overlook the impressive development of mobile. Since the first iPhone landed less than a decade ago, we have seen it grow from 2007 when mobile commerce didn’t exist, to 2016 when M-Commerce is forecast to produce $415 Billion sales, yes you read that correct! It’s only really in the last 5 years or so, that people have seriously considered buying anything on their phones, never mind big ticket or high-consideration items. However, now the experience is so rich on mobile devices, that 51% of sales are now on mobile and 66% of all web traffic happens there. It’s crazy to consider how in such a short space of time, mobile has taken the lead over other already established forms of E-Commerce and this is something that marketers are utilising to drive engagement. We know that SMS messages demand your attention wherever you are and are easy to respond to. 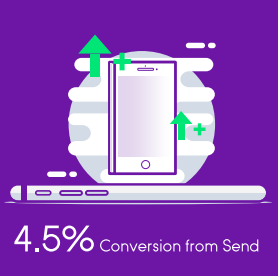 We have seen this work in action with our award winning campaign which saw a massive 4.5% conversion rate from the messages we sent. We also found many other big brands are seeing great returns from investing in SMS campaigns, with this in mind it is clear that SMS is becoming an extremely important part of remarketing strategies. If you would like to see how SMS Remarketing could benefit your company, why not book a demo with us today!